Meanwhile, we have official spring start, even if the weather does not seem to have read the WhatsApp yet. Yesterday I woke up, at the end of March, and there was a snow layer several centimeters high outside. Nevertheless, spring can be guessed. Not for long and it smells like spring everywhere and on the Alster the trees start to bloom. With the beauty of spring, the asparagus season begins again. I love asparagus in all variations. Sometimes I just need a big pile of asparagus, some tasty potatoes and some butter and I am happy. 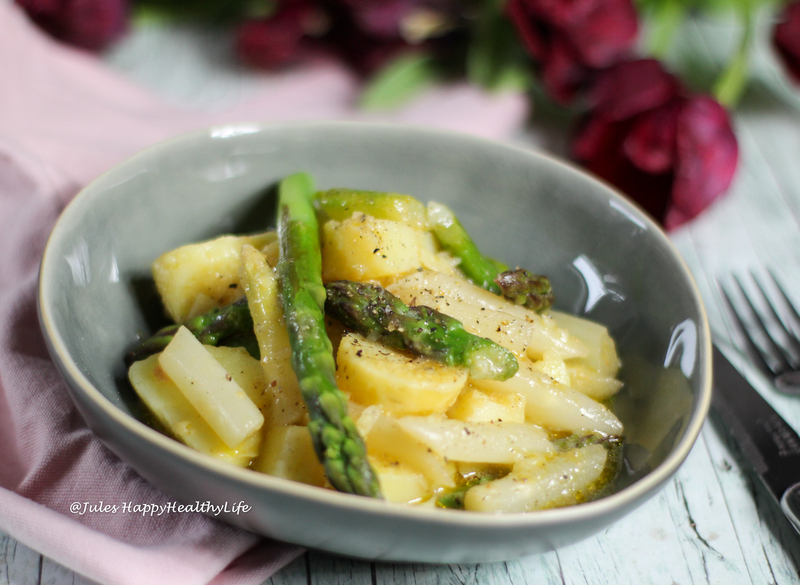 My Warm Asparagus Potato Salad is also very simple, so you can enjoy the asparagus wonderfully. My love for asparagus is certainly no secret. If you like asparagus as well, I also recommend my raw asparagus salad with avocado dressing. Asparagus salad is easy to prepare and you can take it with you to work as well. My Warm Asparagus Potato Salad goes well with a delicious Wienerschnitzel, chicken or steak. If you want to start the barbecue season with the first rays of sunshine, you can serve the Warm Asparagus Potato Salad to grilled fish or seafood. White and green asparagus come together with some tasty potatoes. Due to the cold temperatures, the asparagus season unfortunately starts a bit later this year in Germany. This leaves more time to pick out the best recipes for asparagus dishes. It does not always have to be asparagus with hollandaise sauce, certainly not the lowest calorie option. Asparagus contains a lot of vitamin E.
If the facts do not speak for themselves, then hopefully the taste of my Warm Asparagus Potato Salad. Do not worry, if you should have prepared too much salad, it also tastes great cold. Low calorie salad that is and fast to prepare. What do you need for the Warm Asparagus Potato Salad? What do you need for the dressing of the Warm Asparagus Potato Salad? How to prepare Warm Asparagus Potato Salad? Wash white asparagus, peel and remove the woody ends. Cut into oblique pieces. Cut of the woody ends of the green asparagus. Cut into oblique pieces. Wash the potatoes well and cook in salted water for about 20 minutes, and peel. Cook the white asparagus in boiling lightly salted and sugared water for about 15 minutes. The green asparagus can be added after about 5 minutes, it only takes about 10 minutes. Cut the potatoes into wide slices or quarter them. Put the asparagus and potatoes in a bowl and toss with the dressing. Let it soak for a few minutes and then serve.